Goldenrod blooms right around the time ragweed pollen starts causing trouble, so is often unjustly blamed for causing allergies. The fact though is that goldenrod pollen is heavy and spread by insects, instead of the wind like ragweed is, making it pretty difficult to trigger symptoms of hay fever. You would have to deeply sniff the flower to get the pollen in your nose. Anything – natural or synthetic – that you put on or in your body has a chance of causing allergic reaction in susceptible individuals though. So, don’t think of an allergy to goldenrod as being impossible, just be aware that it’s nowhere near as common as most people think it is. Where you find goldenrod, you’re likely to find some ragweed growing nearby, but otherwise, the two plants look and act very different from each other. 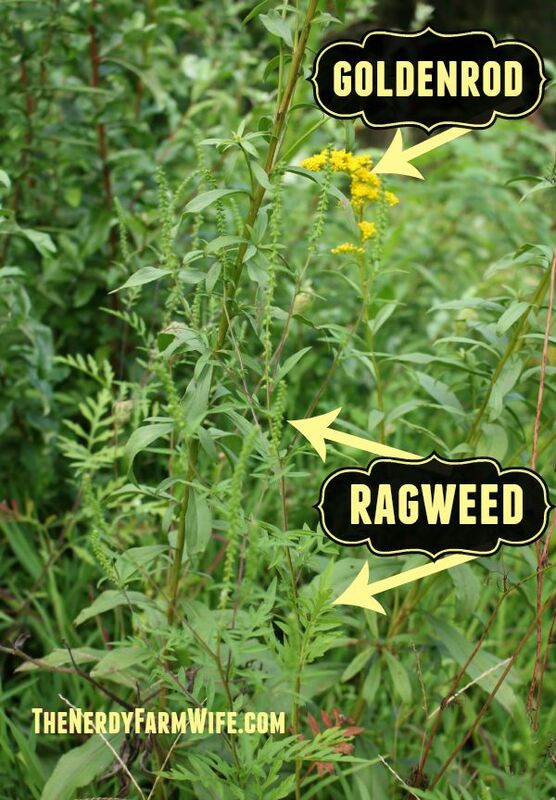 In the photo below, you can see that goldenrod has bright yellow flowers, and that common ragweed has deeply lobed leaves and nondescript greenish flowers. or try a Google search like THIS ONE. Goldenrod is “recommended for treatment of infections and inflammations, to prevent formation of kidney stones and to help remove urinary gravel” (link to study on PubMed). It may lower cholesterol and prevent atherosclerosis (study link), is an effective remedy for upper respiratory inflammation and congestion, rhinitis, seasonal allergy, sinus infection, colds and influenza (Medicinal Plants of the Southern Appalachians, page 92). The infused oil and salve is a traditional remedy for aches and pains and makes a great addition to any arthritis or pain-relieving salves you create. I also love the looks of this goldenrod honey recipe from Pixie’s Pocket and how Plain & Joyful Living used goldenrod to dye yarn! On my want-to-try-list for this month: making goldenrod soap, since I hear it will naturally impart a shade of yellow to the finished bars. I’ll keep you posted how it turns out! I generally dose my family in small amounts (around 5 drops at a time, mixed with a spoonful of raw honey.) I like to start with a little bit and see how it goes. According to Richo Cech in Making Plant Medicine though, an typical adult dose can be as high as 30 to 60 drops of tincture diluted in a little water and taken 3 to 5 times a day. Smaller frames, high metabolisms and milder conditions will need smaller doses while larger body types and more entrenched conditions may need the full amount. Use what feels right to you from that information, but certainly check with your health care provider if you have any questions or concerns before use. Spread the flower heads out on a clean dish cloth or paper towels. Use your fingers or scissors to break up any large sections so that they can air dry in a single layer. You can also hang the goldenrod clusters to dry. Depending on the humidity in your area, this may take a few days or a week or more. Once fully dried, store in a labeled mason jar. Dried herbs generally stay fresh 9 months to a year, but if the color fades considerably, then it’s probably past its prime. Use around 2 tablespoons of fresh flowers per 1 cup of water. If using dried flowers, use half as much (1 tablespoon per 1 cup of water). Cover and steep for 15 to 20 minutes before straining. Sweeten with raw honey, if desired. 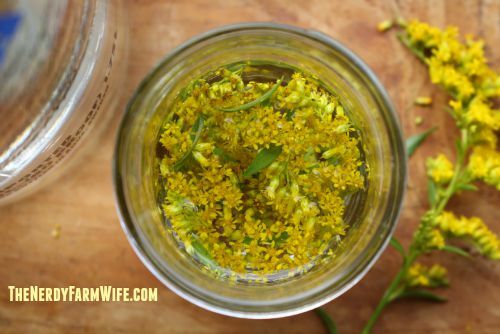 Fill a jar 1/4 to 1/2 of the way with dried goldenrod flowers. Pour an oil (such as sunflower, sweet almond or olive) over the flowers until the jar is full. You can infuse the oil the slow way, the solar way or the speedy way. Slow way – Cap the jar and tuck it into a dark cabinet for 4 to 6 weeks. Strain. Speedy way – Don’t cover the jar, but instead set it down into a small saucepan containing a few inches of water. Set the pan over a low burner and heat for around 2 to 3 hours, watching the oil carefully. You can then strain the oil and use right away, or let the oil continue infusing for another few days before straining. Place the oil and beeswax in a canning jar or heat-proof container. Set the jar down into a saucepan containing a few inches of water, forming a makeshift double boiler. Set the pan over medium-low heat until the beeswax is melted. 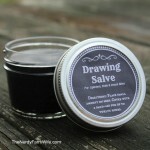 If you used a small canning jar for melting, you can use it for storing the salve as well. This recipe will fill three 2 fl oz tins. If you’d like to make this by volume, the beeswax converts to roughly 1.5 tablespoons (grated or pastilles, packed very tightly in the spoon) and the oil measures out to be approximately 1/2 cup. Use goldenrod-infused oil and salve for muscle aches and pains. 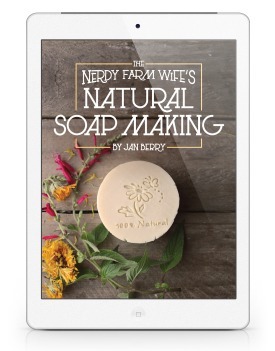 If you enjoyed learning about foraging and using goldenrod, be sure to sign up for my newsletter HERE to get my best herbal projects, soap ideas, and DIY body care recipes sent straight to your inbox, once per month. Tagged goldenrod. Bookmark the permalink. Another benefit of goldenrod is that it increases blood flow in all areas of the body. So lets just say that instead of putting only God knows what into our man’s body from a little “blue”pill, he can take a capsule of goldenrod essential oil mixed with a carrier oil. IT WORKS and it is natural. No need to spend $100 a pill that has harmful side effects. Hi Shay, Thanks for sharing that tip with us! It’s great to know that goldenrod has solid medical uses! It’s certainly common enough around here. The farm we just moved to has an entire field of goldenrod, so I am excited to learn all of this and will be definitely making some salve. Great post as always! thank-you so much. i just picked some today. Awesome info, as usual. My favorite thing lately is finding all the benefits to the “weeds” that are everywhere around me. I’ve learned quite a bit from you, actually, & it’s inspired me to check out all the weeds & wildflowers I find near my house & in my garden. Even my husband checks with me now to make sure it’s not something usable! This stuff has always made sense to him, but he’s not had the time or patience to look it all up! (I don’t have a lot of time either, but I do have the motivation. ) Thanks for all your help with it! 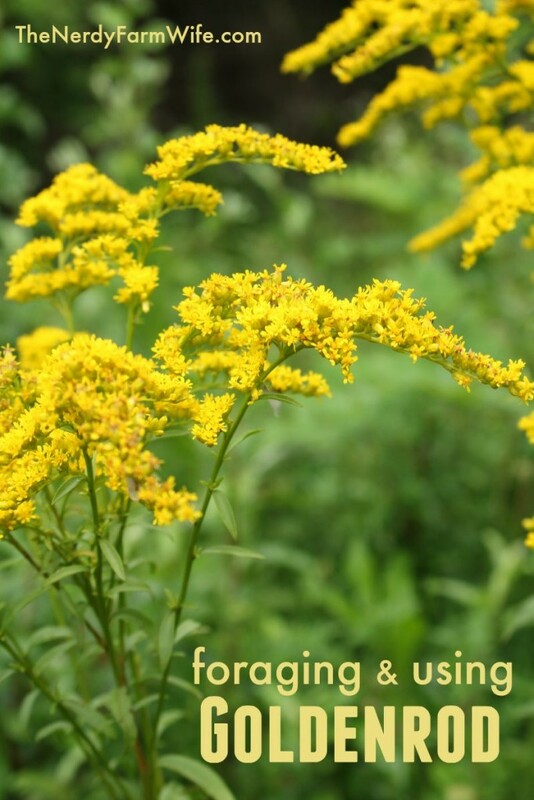 Loved your informative and interesting article on the uses of goldenrod! Thank you for teaching and sharing!!! What perfect timing! :) I love your salve idea too! Hi Kiera! I’ve read it both ways too. I’ve read articles by respected herbalists that like to harvest the stalk, just before the plant blooms, while others (just as respected) use the flowering tops. I’m not sure of the best potency and suspect it may be one of those intuitive things where you go with what feels most right to you. Glad you liked the article! HI thanks so much. Am wondering if it’s best to use only flowers and not any leaves or stems? Hi Pamela! I use mostly flowers and a few leaves, but I know of others that use the whole flowering tops (stems and all). So, it’s okay if some stems and leaves get in there too. Anyone have experience using the fresh flowers in the oil? I have a special fondness for goldenrod– several years ago I was in the middle of nowhere in Canada and developed a UTI. I went out into the yard and there were a few goldenrod plants. an infusion saved my vacation! Hi Louise, What wonderful timing to find goldenrod on your vacation! I do know several herbalists that prefer to use fresh plant matter, you just need to be a little more careful so the moisture doesn’t cause the oil to spoil. Letting your plants wilt overnight so they’re not so high in moisture helps. You can cover the top of the jar with a scrap of cloth or cheesecloth so that it can “breathe” while it’s infusing. Once done, strain your oil and let it sit for a day or two to settle out. Sludge and watery stuff will sink to the bottom and you can carefully pour the good oil off into a clean, dry bottle, leaving the sediment behind. I’ve been following your blog for a while now, and find it such an inspiration! I just cut some goldenrod today, and have some dandelion growing also. Do you think a salve with a mix of these would be beneficial? Just wondering, and starting to experiment! Hi Leona, I’m so happy that you enjoy the blog! :) I love the combination of goldenrod and dandelion flowers. 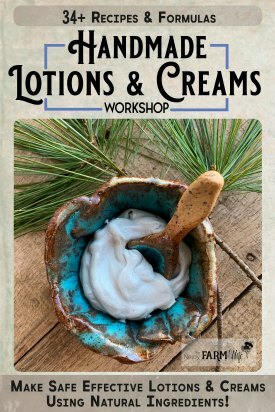 I make a lotion bar (and will eventually get that recipe typed up & on here!) that combines dandelion, arnica, goldenrod and comfrey – great for sore, achey, hard-working hands! 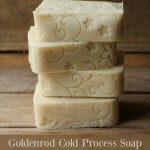 Did you ever make the goldenrod soap? I was wondering what it looked like when it was finished curing. Hi Shawn, I haven’t gotten to make it yet, since I ran out of olive oil. My order from Bramble Berry is supposed to arrive Monday afternoon though and it’s high on my list of things to make! I’m really curious how it will look too. Will keep you posted! 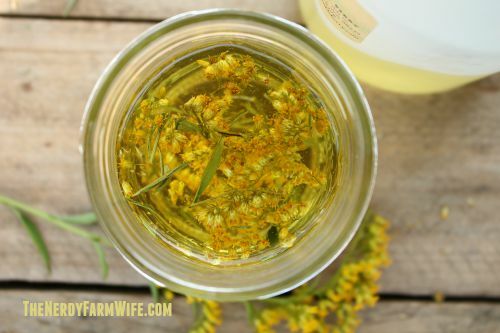 I am infusing goldenrod flowers in olive oil and making goldenrod tea to make into soap this afternoon. Will let you know how it turns out. 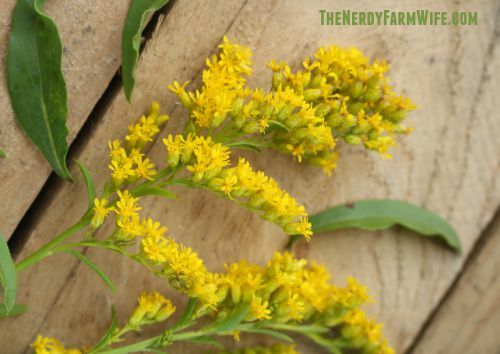 Is there a best way to use goldenrod for certain ailments? 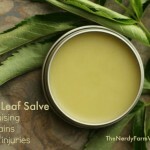 Ex, salve is best for painful joints. Or are you able to get more constituents out of goldenrod in a certain preparation? Do u get more out of it making tea, vinegar or tintype or oil? I have fields of it and want to best utilize it for certain ailments. Sobfar I’ve just drank it as tea, but if I can get more benefit by using a tincture I would prefer that. Is there any proof? What area of the country does it grow? i would like to know so i could go out and forage for it. Thank you Jan for this informative article! I’m also enjoying your latest book (and loved the videos with it). Canada Goldenrod is my first foray into wildcrafting. I’m drying flowers and leaves. I’ll be writing about it soon on Botaniscape.com and http://www.facebook.com/Botaniscape, where I wax poetic about my journey as a budding herbalist. I do hope you’ll join me!